It is hard to ignore the trend toward plant-based diets. 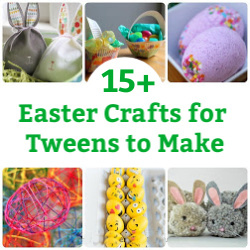 For families this can be a challenge. Finding vegetarian recipes for picky eaters is the ultimate challenge. 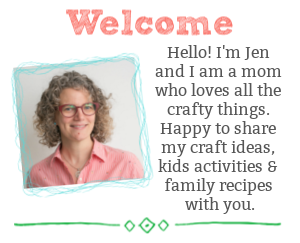 I am forever searching for kid friendly meatless Monday recipes, are you? So, I’ve been taking classic kid-favourite dishes and finding alternatives to the traditional meat. These cheesy lasagna rolls are packed with flavour – even without the meat. I don’t know about your kids, but in our house pasta is always a big hit with our kids. However, lasagna has been a bit of a challenge. It might be that kids don’t always like dishes that combine flavours. But, what if lasagna was fun to eat? 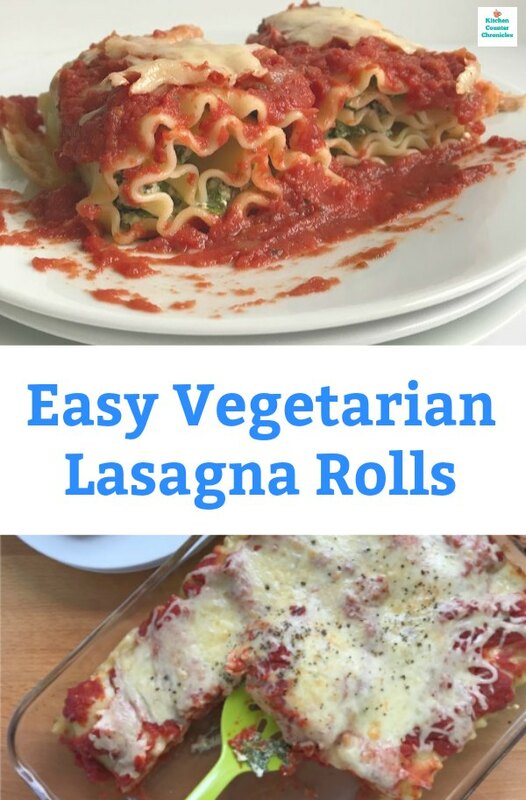 What if lasagna was all rolled up? 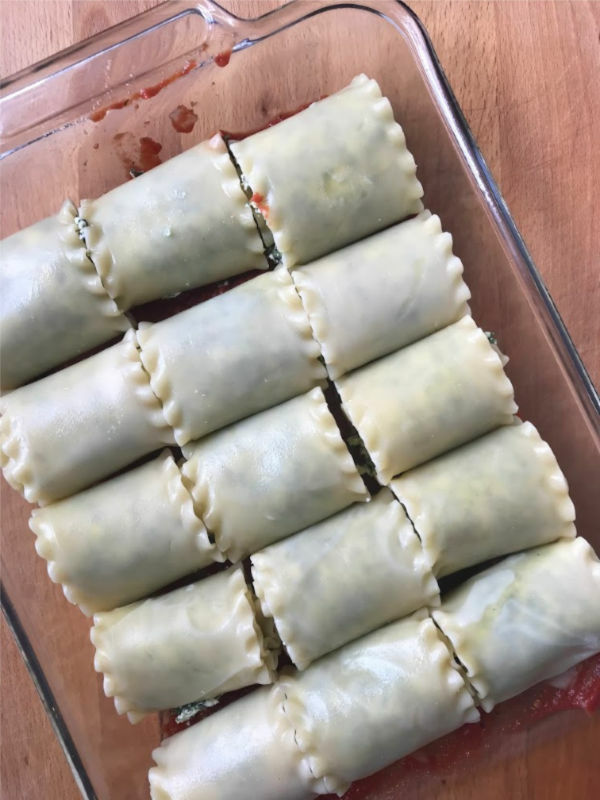 This recipe for vegetarian lasagna rolls became an instant family favourite. Saucy, cheesy and it looks pretty cool too. There’s no need to tell the kids that it is packed with extra nutrient and vitamin rich kale. Start by making the tomato sauce. Heat the olive oil in a saute pan, over medium heat. Add the minced garlic and shallot. 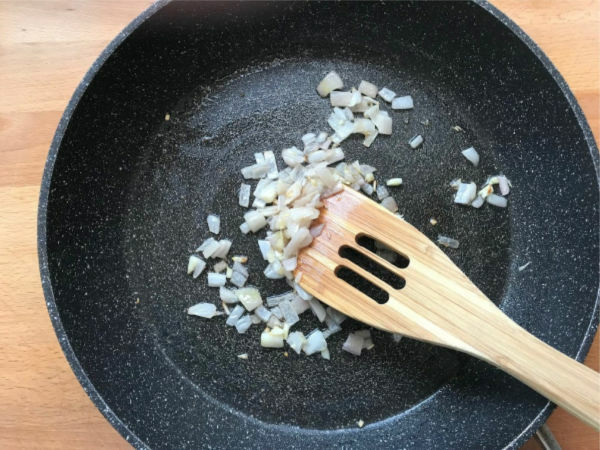 Saute until the garlic is fragrant and the shallot is soft – only a few minutes – you don’t want to burn the garlic. Pour in the can of crushed tomatoes, the tomato paste, the dried herbs, salt and pepper. Bring to a boil and then drop the temperature to a simmer. Let the sauce simmer away, while you prepare the lasagna rolls. Now it’s time to work on the lasagna rolls. Bring a large pot of water to the boil and cook the lasagna noodle, according to the box directions. Be sure that you do not over cook the noodles. They need to be able to roll, without falling apart. When the lasagna noodles are done, drain them into a colander and then toss them with a splash of olive oil, so they don’t stick together. While the noodles are cooking, it’s time to make the filling. 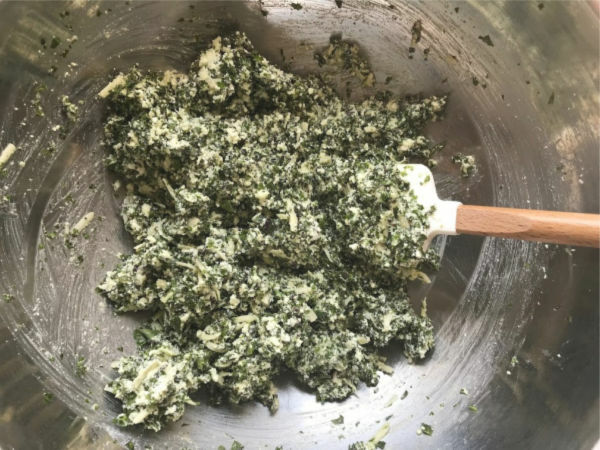 Begin by processing the kale in a food processor. You could substitute thawed, frozen spinach, however the kale provides an earthy, richer flavour than spinach. Add the processed kale to a large bowl. Add in the ricotta, 1 cup of mozzarella, 1 cup of grated parmesan, and 1 egg. Stir everything together, until it is totally combined. It’s time to assemble the rolls. 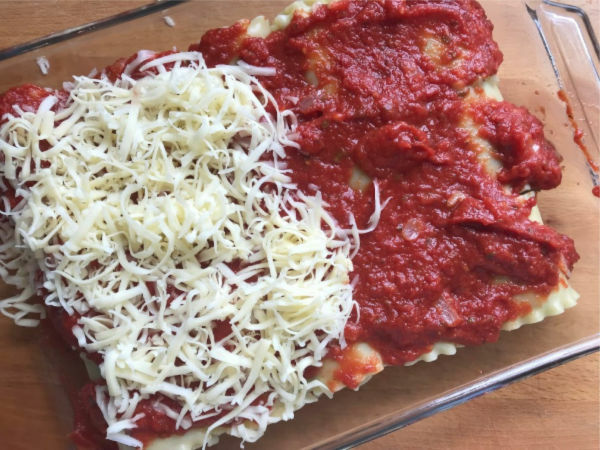 Start by preparing the 9″ x 13″ baking dish – spread 1 cup of tomato sauce in the bottom of the dish. Now, lay the pieces of lasagna on a parchment paper lined surface. Spread the filling along the middle of the piece of lasagna. Each piece of lasagna will use around 2 tbsp of the filling. 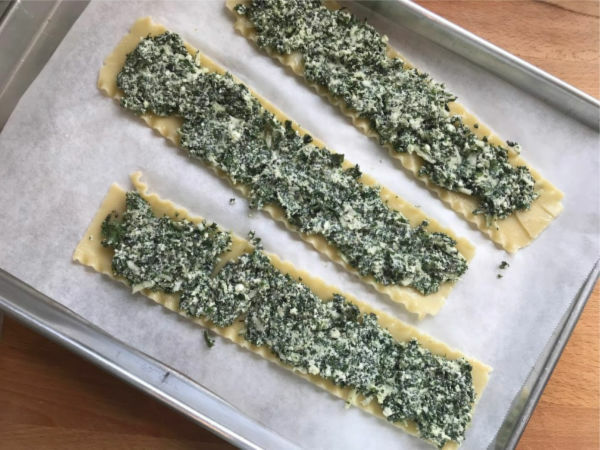 Roll up the lasagna roll and place it in the baking dish, with the seam on the bottom. Keep on rolling and adding the rolls to the baking dish. Your dish should take about 15 rolls. Once the dish is filled with lasagna rolls, it’s time to add the sauce. Spread the sauce all over the rolls. Then sprinkle the remaining mozzarella over the sauce. 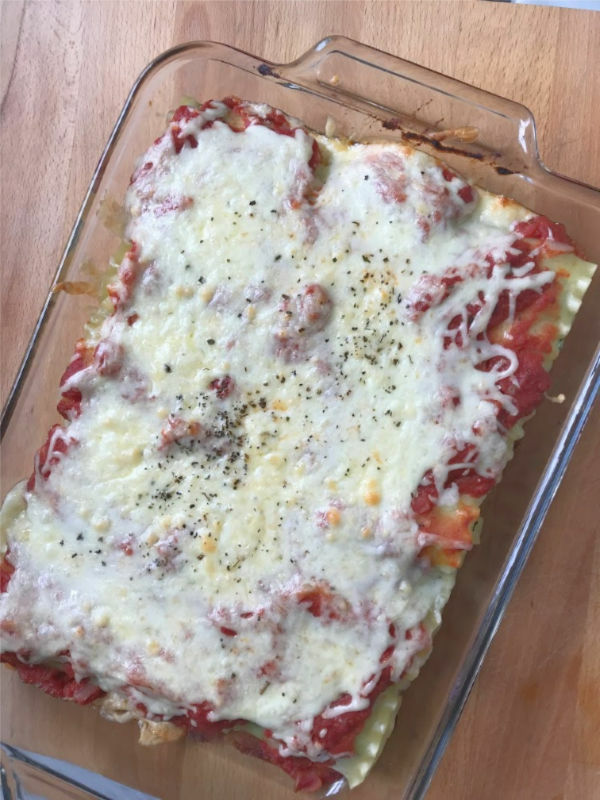 Bake the lasagna rolls for 25-30 minutes. If you like a browned top, place the dish under your broiler until it is toasted. Everyone gets their own plate filled with lasagna rolls. It’s so simple to serve. I love the lasagna curls. 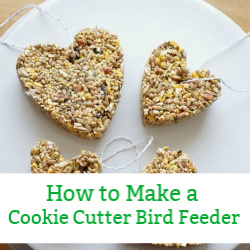 An easy vegetarian recipe that kids are going to love. 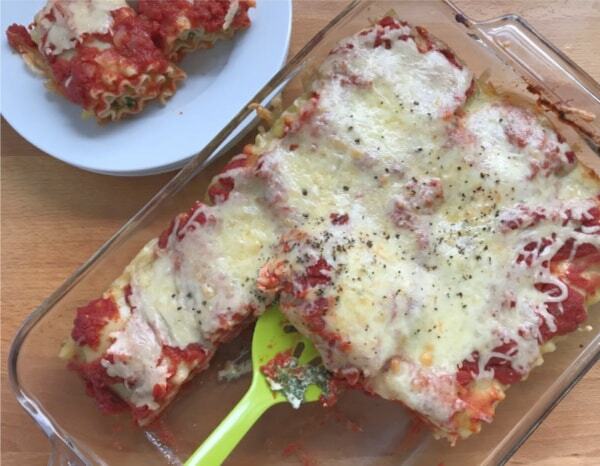 These cheesy lasagna rolls are perfect for meatless Mondays. 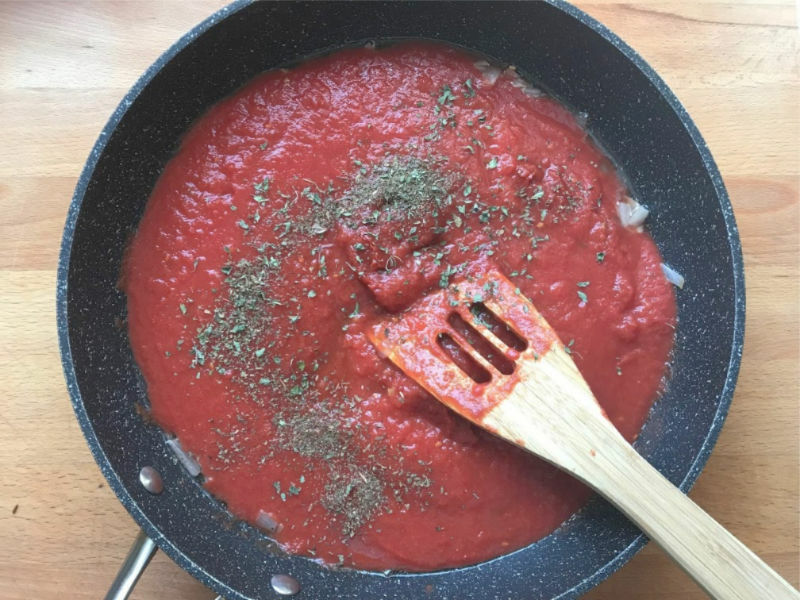 Start by making the tomato sauce. Heat the olive oil in a saute pan, over medium heat. Add the minced garlic and shallot. Saute until the garlic is fragrant and the shallot is soft - only a few minute - you don't want to burn the garlic. Pour in the can of crushed tomatoes, the tomato paste, dried herbs, salt and pepper. Bring to a boil and then drop the temperature to a simmer. Let the sauce simmer away, while you prepare the lasagna rolls. Now it's time to work on the lasagna rolls. Bring a large pot of water to the boil and cook the lasagna noodle, according to the box directions. Be sure that you do not over cook the noodles. They need to be able to roll, without falling apart. When the lasagna noodles are done, drain them into a colander and then toss them with a splash of olive oil, so they don't stick together. While the noodles are cooking, it's time to make the filling. 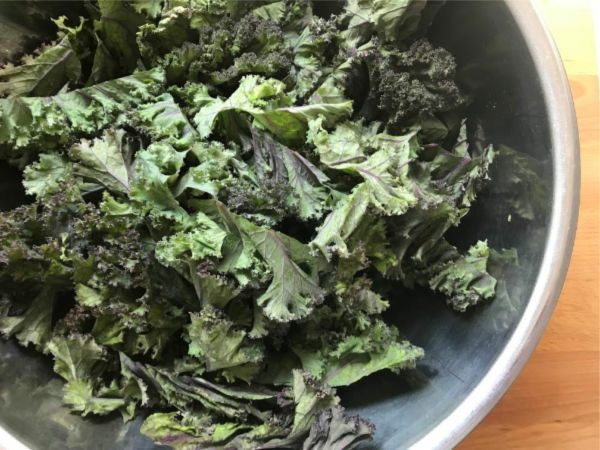 Begin by processing the kale in a food processor. You could substitute thawed, frozen spinach, however the kale provides an earthy, richer flavour than spinach. Add the processed kale to a large bowl. 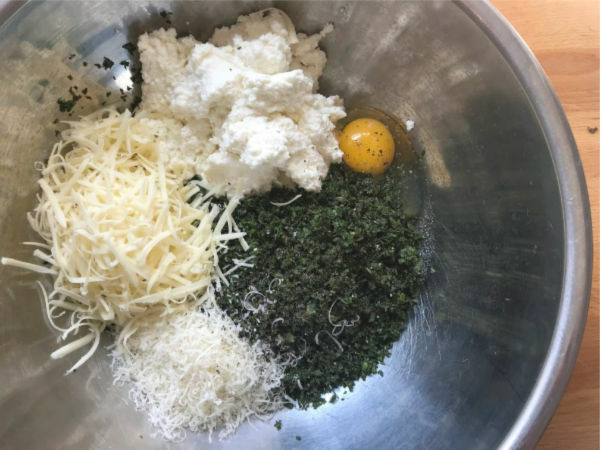 Add in the ricotta, 1 cup of mozzarella, 1 cup of grated parmesan, and 1 egg. Stir everything together, until it is totally combined.It's time to assemble the rolls. Start by preparing the 9" x 13" baking dish - spread 1 cup of tomato sauce in the bottom of the dish. Now, lay the pieces of lasagna on a parchment paper lined surface. Spread the filling along the middle of the piece of lasagna. Each piece of lasagna noodle will use around 2 tbsp of the filling. 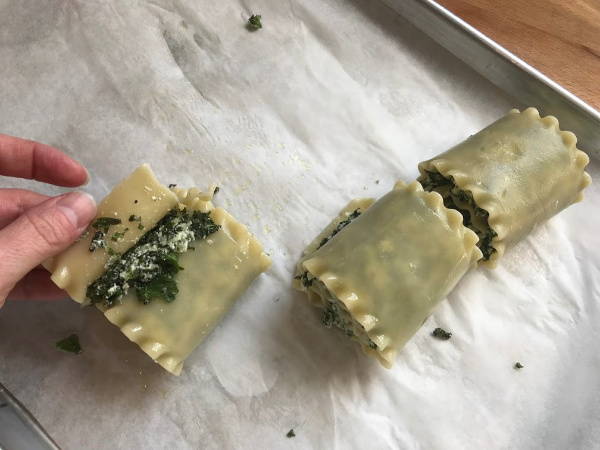 Roll up the lasagna noodle and place it in the baking dish, with the seam on the bottom.Keep on rolling and adding the rolls to the baking dish. Your dish should take about 15 rolls. Once the dish is filled with lasagna rolls, it's time to add the sauce. Spread the remaining sauce all over the rolls. Then sprinkle the remaining mozzarella over the sauce. Nutrition Info is to be used as a rough guide only. Nutrition Info is based on the products I am using an you may not be using the same products/brands. Thus, the nutrition info may vary. These lasagna rolls make a great addition to the kids’ lunch boxes. They separate so easily and can be quickly reheated. So, if you’re on the hunt for vegetarian dishes that your entire family will love, you have to try these rolls. 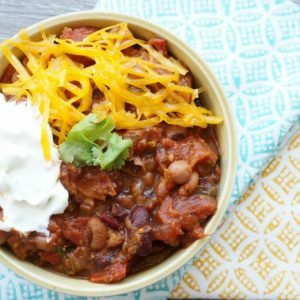 Make a big batch of our vegetarian chilli, it’s so hearty and delicious – you won’t miss the meat. 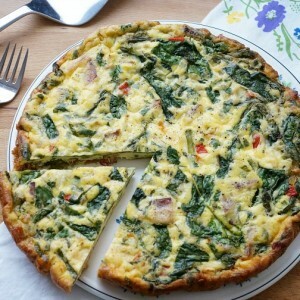 Bake up this spring frittata for breakfast, lunch or dinner.